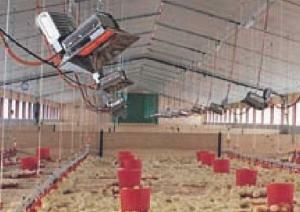 SBM supply radiant panels for intensive livestock farming in both gas-fired [LPG] and electric versions. Gas fired units are available in ratings from 1.98 MJ/hr [0.55 kW] up to 31 MJ/hr [8.55 kW] and with options of manual or fully automatic operation. All units are equipped with override buttons so that the units normally requiring electric start can still be used when a power failure occurs. Heaters are AGA Approved for operation on LPG at a pressure range between 6.0 and 16 kPa so that all models can be operated at high or low rate to suit the temperature conditions required for the livestock. With infrared ceramic heating, the birds and and animals get optimum comfort while no heat is wasted and the roof stays cool.